You are currently browsing the tag archive for the ‘brush’ tag. I was commissioned to create this wonderful Golden Anniversary cake for a couple celebrating 50 years of wonderful marriage. Congratulations you both. 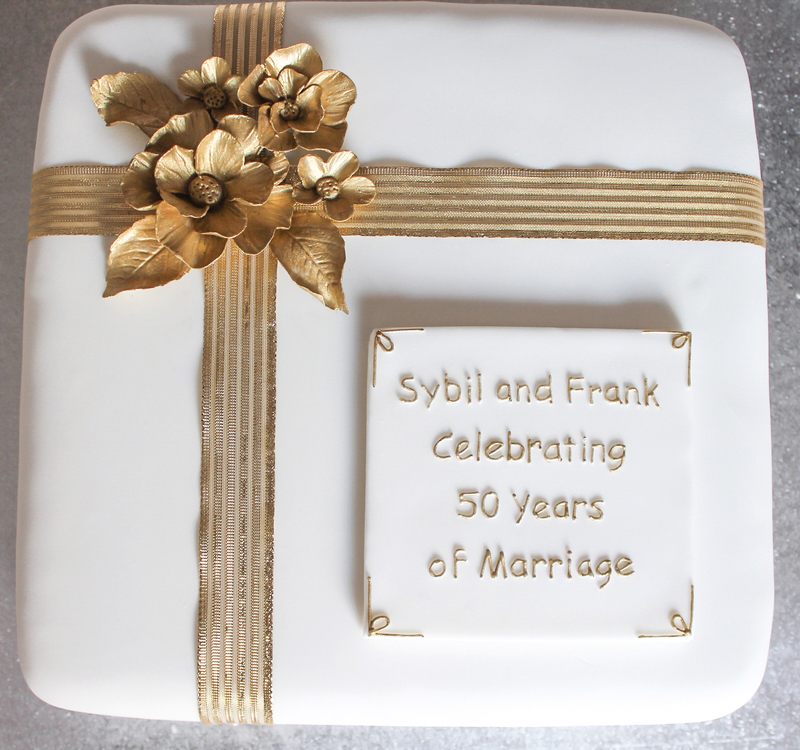 This couple are a real inspiration and so they required a beautiful fruit cake decorated in gorgeous gold flowers to signify their 50 years together. 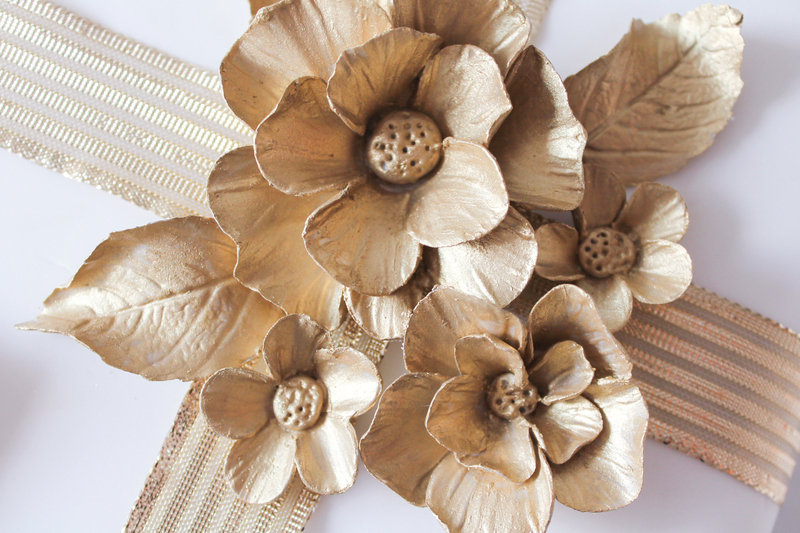 I really enjoyed creating these little flowers using specialist cutters and veiners and then finished these by painting them gold once they had dried. When searching for the correct ribbon I had my gold lustre dust in my hand and the ribbon in the other as I wanted a good match (there are a few different golds – two different golds would clash and not look beautiful enough). And then with a steady hand I piped the wording onto a pre-hardened plaque I had made. Once that was dry I used the finest brush I had to painted the piping in the same gold. If you’d like me to decorate a cake in a similar bespoke style for a special occasion then please feel free to contact me for a quote. Copper Top Cakes is based in Nottingham and delivers to the East Midlands area. I am reachable between 1.00pm – 2.00pm in the day and evenings. Leave me an email or a message and I will get back to you as soon as possible. Well here I am again with the second sample for ‘Painting on Icing’ I used at my demo. I like to have a go at what is on trend but it is nice to come up with something original. It’s amazing all the inspiration that is around you to help you design something different to what everyone else is creating. I found a pattern I liked but changed it to be my own and the colours I loved so I picked similar colours to the original pattern. Another pattern with different colours on could have been used for the inspiration instead. I started off by painting a watercolour version with my changes on watercolour paper to see if I liked it. Drawing around my cutting tools on the paper to see how the final version would look helped too. 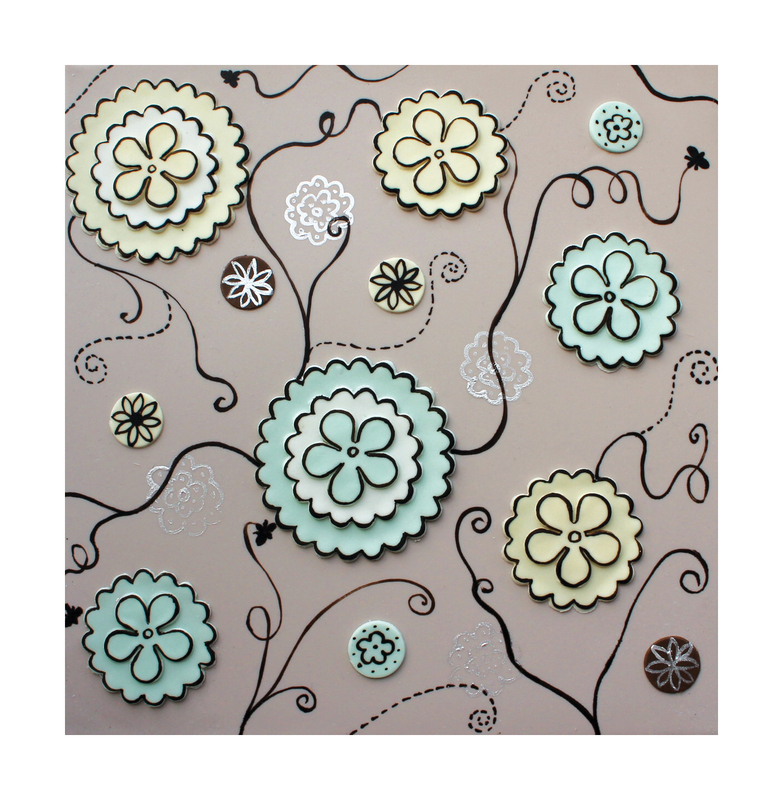 The flower shapes in the middle are different flower shapes to the original pattern – I just looked in my tool box and used a flower and scalloped edged cutter I already had and a piping nozzle was used for the small circles. My special mixture of edible food colours were made to create a thick paint that dries slowly in the palette but quick on the sugarpaste. The edge of the scallops and the flowers were painted in a dark brown with a very fine artists brush and the swirls were all painted free hand. Also I painted some pretty flower shapes in pearl lustre that show up when they catch the light. I feel that this was a very attractive, modern and was far different from the original inspired pattern I found and turned into my own design. This unique sample looks amazing and could easily be applied to make a spectacular multiple tiered wedding cake.. If you’d like me to decorate a cake in this style for a special occasion then please feel free to contact me for a quote. Copper Top Cakes is based in Nottingham and delivers to the East Midlands area.